What’s Next For Mikey Garcia? The options Mikey Garcia has for his next fight are still a mile long. It’s time to dissect which fighters he should be aiming for next. 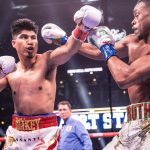 The post What’s Next For Mikey Garcia? appeared first on Round By Round Boxing.